Utah is hailed as one of the best places to study geology as it is replete with stunning scenery, unique landforms and is one of the few places in the country where all three types of rock (igneous, sedimentary and metamorphic) can be found. USU Eastern’s Geology Department recently took one of its classes on a day-trip to Capitol Reef National Park to study unique geologic formations such as Hickman Bridge and Capitol Reef’s folded rock formation, known as a “monocline,” which formed a reef-like, north-to-south barrier to early settlers. The other half of its namesake comes from a line of whitish domes that formed in part of the sandstone, all of which resemble the U.S. Capitol Building. The park is of special interest to budding geologists because it tells a stunning old tale—the tale of geologic time. There is nearly 10,000 feet of sedimentary strata (layers) at the park, representing nearly 200 million years of geologic history. Some of the oldest rocks there are as old as 270 million years old, while the youngest are approximately 80 million years old. By studying these layers and their unique characteristics, geology students can learn much about the history of the area, including how erosion has shaped this special area. 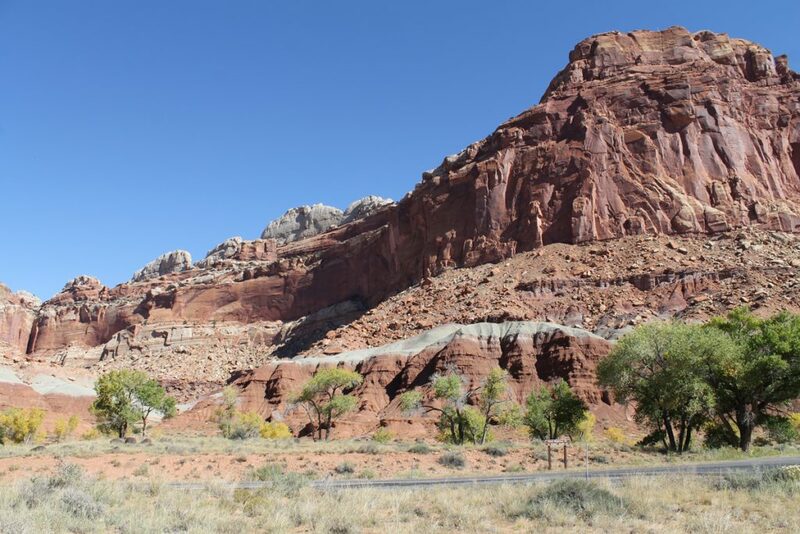 Some 10 to 15 million years ago, the entire area was uplifted well over a kilometer by the same geologic processes that formed the Colorado Plateau. The existing formations were left mostly intact. Wind and water erosion were mainly responsible for the landscape we see today which likely occurred between one and six million years ago. It seems counter-intuitive that water could be the main erosional agent in a desert climate such as this, but that is exactly how the stunning canyons we now see were formed. Established as a national park in 1971, the park preserves 241,904 acres and is open all year, though the park is busiest from May to September. It is located 124 miles south of Price just outside of Torrey, Utah, and can easily be reached and explored in a day or less by traveling south on UT-10, continuing onto UT-72, and finally turning left onto UT-24 until you reach the posted turn-off for the state park. With most roads easily accessible with standard vehicles, abundant restrooms near popular locations and an interactive visitor’s center, the park has plenty to offer both locals and tourists. Next Hamlet: to go or not to go?